with symptoms that may range from a mild upset stomach to permanent damage or death. Everyone has heard about poisonous mushrooms but few people realize that some of the deadliest species are look-alikes for some of the tastiest species. And you would not be able to distinguish the difference by nibbling a sample. Even a small sample of some of the “bad actors” can be lethal, leading to painful symptoms and organ failure. If this scares you out taking a risk then this article has served a good purpose. If you wish to enjoy a safe, tasty experience with a highly-prized mushroom species, just take up the hobby of growing your very own shiitake mushrooms. 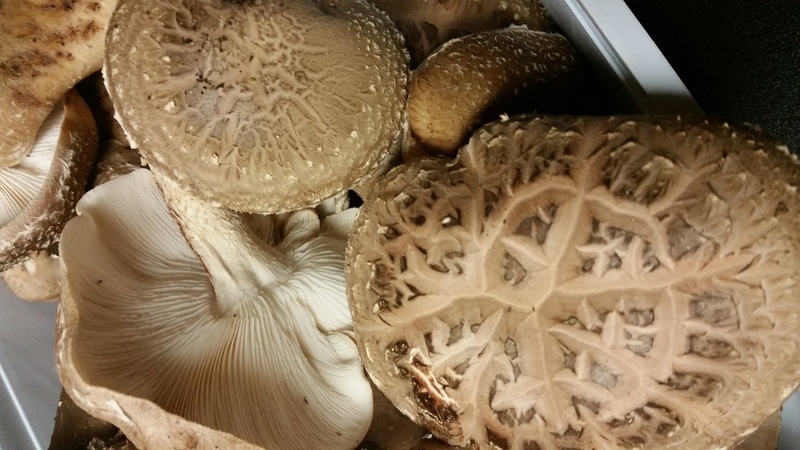 Shiitake comes from the root Japanese “shii” (meaning oak) and “take” (for mushroom). Shiitake mushrooms are a billion dollar industry in Asia with 92% of the world production coming from Japan. Many culinary and medical uses have been identified. This species was only available as dried mushrooms in the US until 1972 but with the removal of a ban on importing live fungi a commercial industry has blossomed. 1. 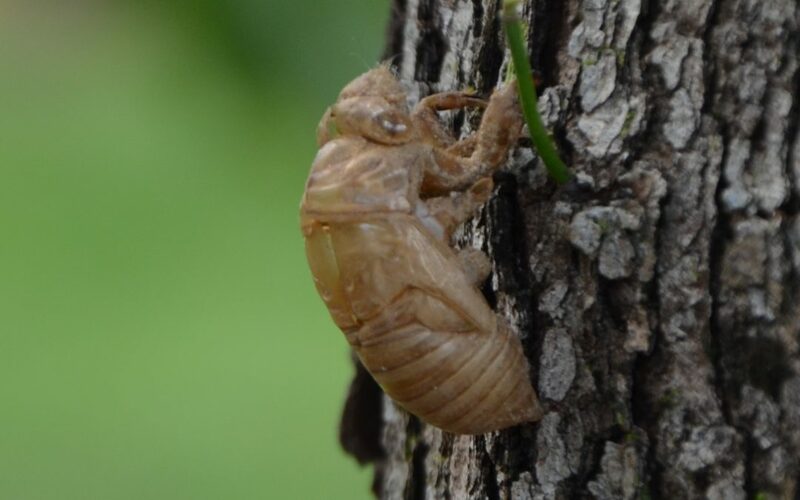 You must acquire living Shiitake inoculum (the mycelial or rooting stage) already growing on a wood medium, usually hardwood dowels or sawdust (internet search will yield many providers). 2. Proper cutting and handling of the logs to be inoculated is important. Cut trees close to the time of inoculation (2 weeks max. ), 4-8 inch diameter and 3-4 feet long. 3. Inoculate by drilling holes in the logs, inserting the living inoculum/spawn and seal the holes with melted wax to retain moisture. A single log may have 30-40 holes drilled in it. 4. 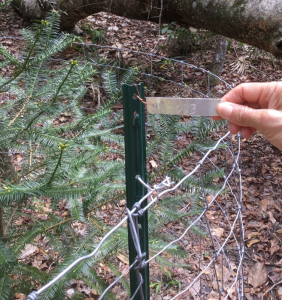 Place logs in a shady/moist environment (i.e. under the canopy in a woodlot with at least 75% shade). 5. Maintain logs by wetting during dry spells. A sprinkler or mister run for a couple of hours a day works well. 6. Proper harvesting and storage is most important and information is available in many places online. 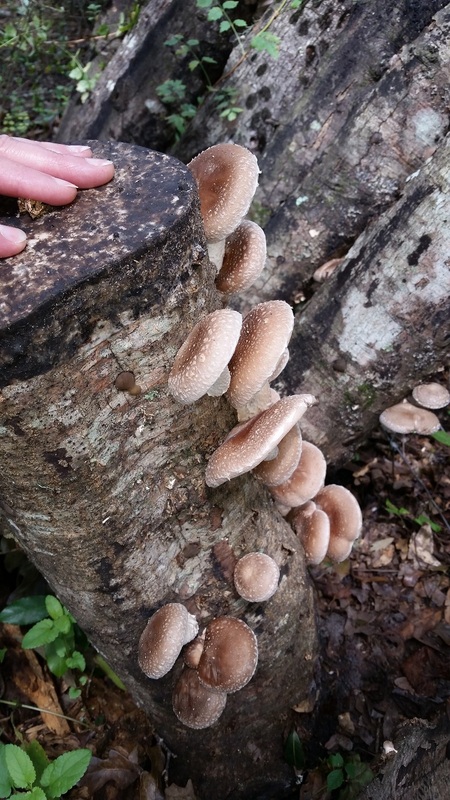 Shiitake fruiting is usually triggered by changes in temperature and humidity so spring and fall are key times to check your logs. It does not take long for a mushroom to go from the early “pinning” stage to mature, so weekly checks are advised. Significant tropical weather events will also stimulate fruiting. Logs produce mushrooms for at least two years, until the nutrients in the wood are used up. Don’t be in a hurry though, as the full colonization of the log by the mushroom mycelium will take up to 9 months before mushrooms begin to appear. Remember, beware the risks of harvesting wild fungi. A small-scale shiitake growing operation is a safe alternative for getting your “mushroom-fix.” Also, be ready to compete with a squirrel or two for your crop as they know a good thing when they see it too. Which Local Creatures Eat Venomous Snakes? 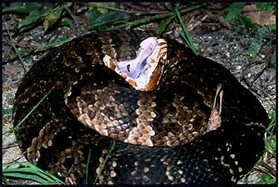 The “cottonmouth” gape of this venomous snakes is a warning. Notice the banded coloration of this individual. First, most who do only consume smaller species of snakes – but the list is still surprising. Spiders… spiders were on the list. He specifically called out the black widow – who probably could kill a small snake, but indicated there were others. 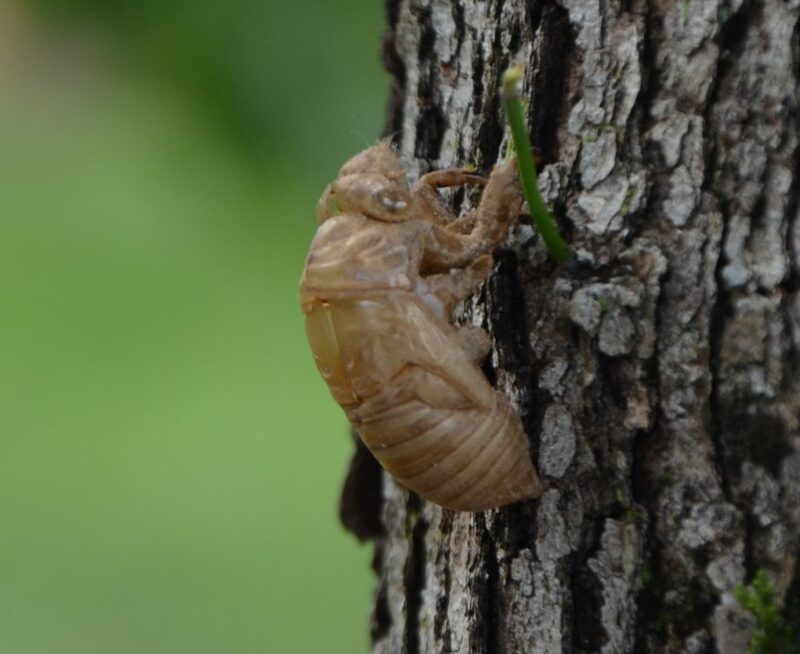 Scorpions, centipedes, fire ants, carpenter ants, giant water bugs, crayfish, and crabs made the list as well. Some of these may consume snakes only after they are dead – but some can kill small ones. 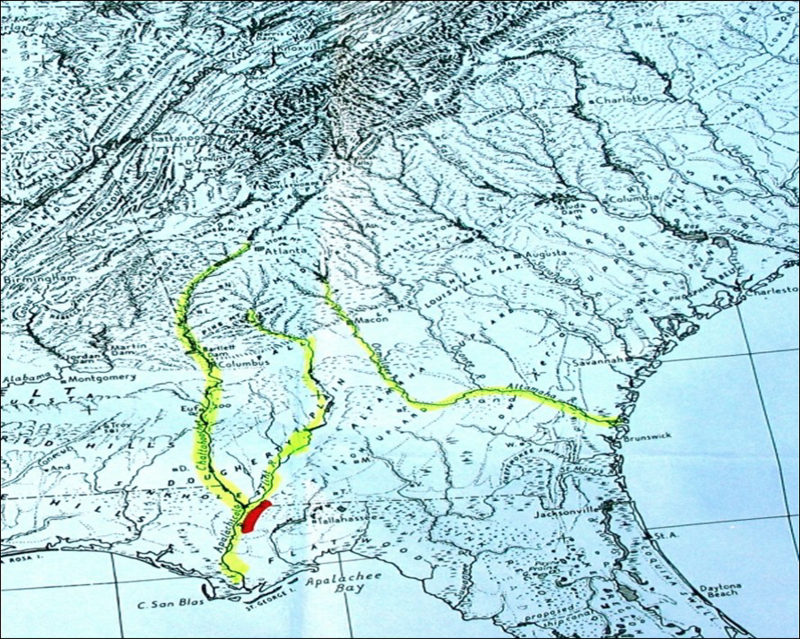 From the vertebrate world he mentions the larger salamanders (such as the hellbender), and other snakes (such as the short-tailed snake and the coral snake). There are several mammals including shrews, moles, and even the rodents themselves are consumers of snakes! He describes how hoofed mammals (such deer, goat, and horses) do not consume snakes, but can completely destroy one by raising and stopping on them – leaving only small segments remaining. They have found the remains of snakes in the stomachs of all predatory mammals but the snake’s greatest threat are birds… by a long shot. Species from passerines to raptors have been known to kill and consume snakes. What about venomous snakes – who consumes rattlesnakes and cottonmouths? Bullfrogs… bullfrogs basically consume what they can get into their mouths but this includes snakes – and venomous ones as well (though they would be small ones). From the fish world, both the gar and largemouth bass are known to consume venomous snakes. A coyote moving on Pensacola Beach near dawn. Photo provided by Shelley Johnson. Opossums are known to consume at least 12 species of snakes, including venomous ones. They also consume ticks, fire ants, and have a very low occurrence of rabies – a cool animal to have around. Other mammal consumers of venomous snakes include raccoons, otters, fox, bobcats, coyotes, and black bears. It is understood they must take smaller members of the venomous snake population – but a snake control is snake control. Most wading birds in our marshes consume snakes, including venomous ones, but it is the red-tailed hawk and the great horned owl that are the masters. Red-tailed hawks are known to consume at least 35 species of snakes, including venomous ones, and – unlike other snake predators – are a larger part of their diet, they seek them out. Great Horned Owls consume at least 13 species, and venomous ones are on the menu. From the reptile world we begin with the alligator, who has little problem consuming large specimens of both the rattlesnake and the cottonmouth. However, many are snakes… yes, snakes eat snakes and some consume venomous ones. Coral snakes, coachwhips, and cottonmouths have been known to consume other snakes. However, it is the Eastern Indigo and the Kingsnakes who actively seek out venomous species. It is known that kingsnakes have a protein in their blood that makes them immune to the viper’s venoms – and it appears the vipers know this and avoid them. It is not known whether the indigo is immune, but it is known they will seek out venomous snakes and consume. Both of these snakes can take relatively large venomous species. Of these two, it is the Kingsnake who is the “king” – consuming at least 40 species of snakes. However, both the kingsnakes and the indigo are on the declined. The eastern indigo is currently federally listed as endangered – there has not been a verified record of one in the Florida panhandle since 1997. However, there are anecdotal reports and we encourage anyone who has seen one to send us a photograph. 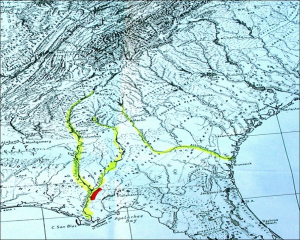 There is an active indigo restoration program going on in Alabama and in the Apalachicola River area. These are the largest native snakes in the U.S. (about 8 feet) and, along with the six-foot kingsnakes, are frequently killed. There is evidence that as the eastern kingsnake populations decline copperhead populations increase, and Vis versa. Some areas near Atlanta are currently experiencing a copperhead “boom”. Clearly, we should reconsider killing both the indigo and kingsnakes. We also understand that habitat loss is another cause of their decline, particularly in the case of the indigo. When looking at this list of snake consumers we see species that cause other problems – alligators, raccoons, coyotes, and bears have all have had their negative issues. But many we just do not like, such as the opossum, really cause us no harm and control snake populations. Everything has its place in the local environment and not one species seeks out humans for the purpose of harming us – this would include snakes. The negative encounters are for other reasons. But for those who have a deep fear, or are currently experiencing high snake numbers, seeing one of the animals on this in the neighborhood could be a relief. Graham, S. 2018. American Snakes. 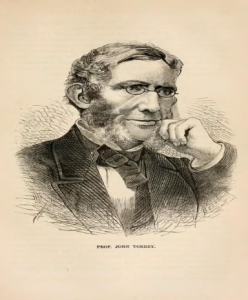 John Hopkins University Press. Baltimore MD. Pp 293. O’Connor, M. 2018. Personal communication. 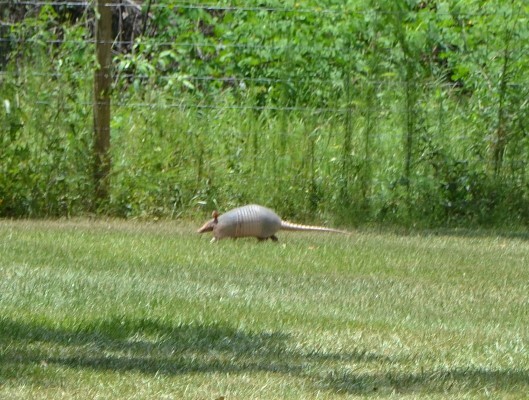 The common nine banded armadillo scurrying across the lawn. The first light of morning can reveal random pockmarks in what had been the perfect lawn the previous evening. The culprit is not likely the neighborhood teenager with a reputation for inappropriate practical jokes. The offender usually is the nine-banded armadillo, sometimes referred to as a Florida-speed-bump or Possum-on-the-half-shell. In addition to manicured landscapes, they also encroach in natural areas and destroy sensitive habitats. Armadillos eat adult insects and larvae, but also quail and turtle eggs. They incessantly dig holes in their search for food, many times uprooting plants in their food search. Their foraging holes are approximately one to three inches deep and three to five inches wide. Using insecticides in landscapes to decrease the armadillo food supply is not guaranteed, but may help reduce the digging. In cases where there is a large, and always ravenous, armadillo population this reduction of food may increase digging activity as they search more diligently for a smaller food supply. Another consideration is all chemical treatments have to be reapplied on a permanent basis for long term control. Always read and follow label instructions for safe use of insecticides. Armadillos rest in a deep burrow during the day and are usually active after dark. Burrows openings are approximately seven to eight inches in diameter, about the size of a one-gallon plastic jug, and up to 15 feet in length. This exotic invasive may burrow under driveways, foundations and patios potentially causing structural damage. Additionally, their burrows in pastures pose a potential leg-injury hazard to large wildlife and livestock. Several live-trapping techniques can be used to capture armadillos as they exit of their burrows. Because armadillos are nocturnal, trapping techniques designed to capture them as they emerge from their burrows should be applied late in the afternoon and checked several hours after darkness. 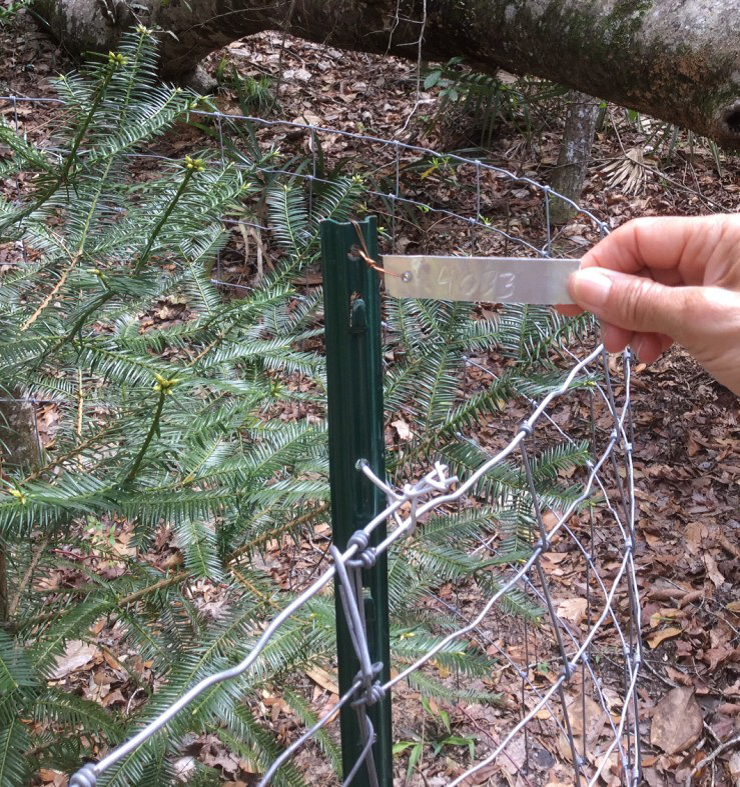 Fencing is another option to discourage the presence of armadillos. Relocating captured animals is illegal and not recommended because it only transfers the problem elsewhere and can spread this problem species. Fossil records indicate the armadillo’s ancestors were as large as modern-day rhinos. One can only imagine what front yards would look like if they still existed. In the last article, we discussed what phytoplankton are, what their needs were, and their importance to marine life throughout the Gulf and coastal estuaries. In this article, we will discuss the different types of phytoplankton found in our waters. The spherical shape of the centric diatom. Marine scientists interested in the diversity and abundance of phytoplankton will typically sample using a plankton net. There are a variety of different shapes and sizes of these nets, but the basic design would be funnel shaped with a sample jar attached at the small end of the funnel. The plankton net would be towed behind the research vessel at varying depths for a set period of time. All plankton collected would be analyzed via a microscope. According to the text Identifying Marine Phytoplankton (1997) there are at least 14,000 species of phytoplankton and some suggest as many as 120,000. Most of these, 12,000-100,000, are diatoms, one of five classes of marine phytoplankton. 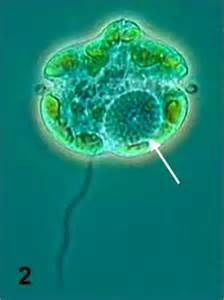 The majority of the phytoplankton fall into one of two class, the diatoms and the dinoflagellates. 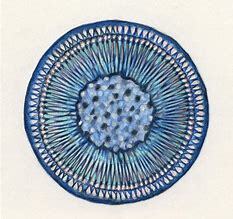 Diatoms are typically single celled algae encased in a clear silica shell called a frustule. The frustule can come in a variety of shapes, with or without spines, and many resemble snowflakes – their quite beautiful. They are found in the bay and Gulf in great numbers, as many as 40,000,000 cells / cup of seawater. They are the dominate phytoplankton in colder waters and are most abundant near upwellings. These are the “grasses of the sea” and the base of many marine food webs. When diatoms die, their silica shells sink to the seafloor forming layers of diatomaceous earth, which is used in filters for aquariums and oxygen mask in hospitals. Dinoflagellates differ from diatoms in that they produce two flagella, small hair-like projections from the algae that are used for generating water currents and movement. Their shells are not silica but layers of membranes and are called thecas. Some membranes are empty and others contain different types of polysaccharides. Dinoflagellates are more abundant than diatoms in warmer waters. There are about 2000 species of them. One type, Noctiluca, are responsible for what locals call “phosphorus” or bioluminescence. These dinoflagellates produce a blue-ish light when disturbed. Many see this when walking the beach at night. Their footprints glow for a few seconds. At night, boaters can see this as their prop wash turns the dinoflagellates in the water column. The bioluminescence is more pronounced in the warm summer months and is believed to be defense against predation. The light is referred to as “cool” light in that the majority of the energy is used in producing light, not lost as heat as with typical incandescent bulbs – hence the birth of the LED light industry. Several dinoflagellates produce toxins as a defense. Some generate what we call red tides. In the Gulf of Mexico, Karenia brevis is the species most responsible for red tide. Red tides typical form offshore and are blown into coastal areas via wind and currents. 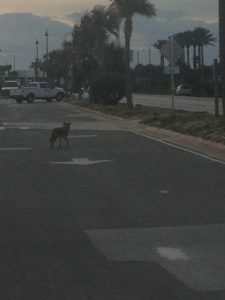 They are common off the coast of southwest Florida but occur occasionally in the panhandle. Many local red tides are actually formed in southwest Florida and pushed northward via currents. Red tides are known to kill marine mammals and fish, as well as closing areas for shellfish harvesting. Like true plants, phytoplankton conduct photosynthesis. Between the diatoms and dinoflagellates, 50% of the planet’s oxygen is produced. These are truly important players in the ecology of both the open Gulf and local bays. Assemblages in Surface Waters of Ryder Bay, Antarctica. Polar Biology vol 33. Pp. 13-29. Company. San Diego CA. edited by C.R. Tomas. Pp. 858.